Apparently Walmart is in the process of changing the packaging of their Great Value products. These are the store-brand equivalents of popular name-brand items, but at a cheaper price. I've noticed that for some reason, instead of making their packaging colorful, eye-catching, and similar to the brand names they're competing against--like they used to do--the marketing gurus at Walmart have chosen instead to go with a plain white background on their Great Value products, something reminiscent of the old unattractive "No Name" brands of food that came out a couple of decades ago. In many cases this packaging choice makes their products seem dull and uninviting--sort of like a purging of any personality--but in the case of their cereals, this blankness just accentuates the weirdness inherent in their choice of branding. 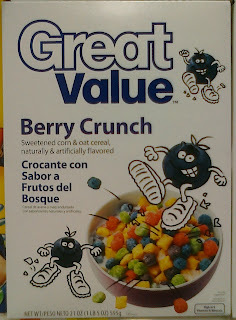 Take, for example, their Berry Crunch cereal. I don't know about you, but I find these blueberries rather evil-looking and intimidating. Who wants to put that stuff into their mouths first thing in the morning? They're like blue angry parasites. Then there's Cocoa Cool. 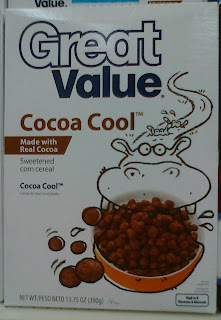 Outside of the dorky sounding name, there's the image of a hippo opening his mouth with a bunch of brown stuff in it. I know that hippos may bathe in dirty water, but what might this box-top image suggest? 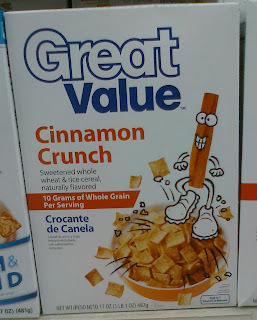 The little mascot on Cinnamon Crunch makes me sad. He looks like he's dancing in a pathetic attempt to gain our approval. I think we've all known such figures, people who just try too hard to fit in and in doing so, turn us off completely. Sorry, little Cinnamon Crunch dude...you are not loved. I'm not sure what it is about fogs and fruit-related sugary cereal, but apparently someone at Walmart thought the two would go together. 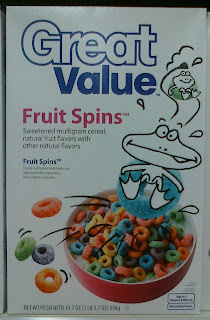 Froot Loops' Toucan Sam makes sense, since he's as colorful as the cereal he sells. But a frog? And a completely goofy-looking one at that? Then there is Walmart's new packaging of the toaster pastries. These are just a couple of examples of the demented-looking pastry dudes that they're showcasing on their packages. Again, I ask you: are any of you comfortable enough with putting any of this stuff into your mouths early in the morning? These are strangely similar to the old "No Name" packaging. Even tho these new boxes have insane characters on them. 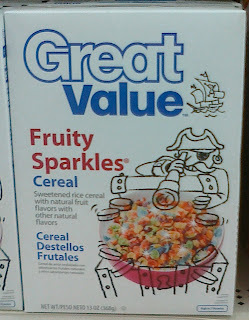 And why, may I ask, do you have so many boxes of Wal Mart cereal, hmmmmmm?